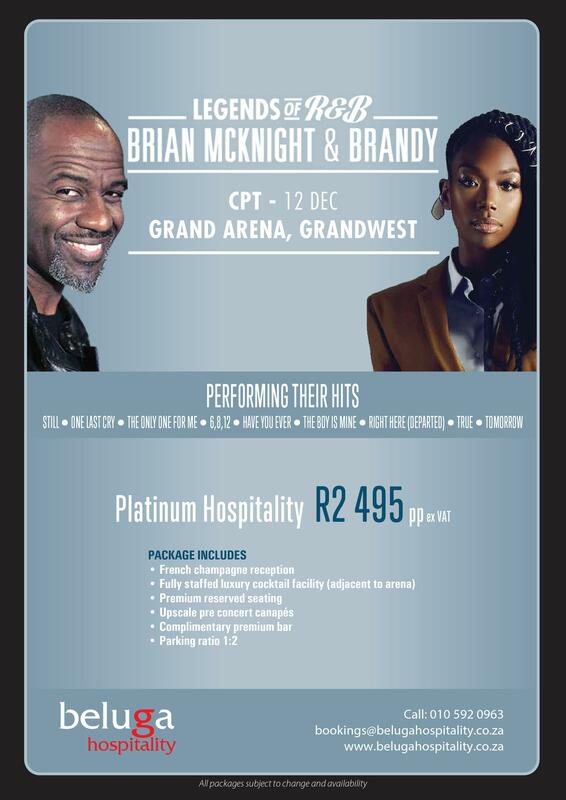 The Legends of R&B, will be returning to South Africa in December 2017 featuring Brian McKnight and Brandy. As an artist who needs no introduction, Brian McKnight has earned himself a spot in contemporary music history. He has released 17 albums to date, with several going 2 and 3x platinum, and he has sold over 30 million albums worldwide. Brandy has sold more than 40 million albums worldwide (including the 5x-platinum selling Never Say Never) and is ranked one of the best-selling female artists in American music history by the RIAA, having sold over 11 million albums in the United States. Contact Grant Wilson on 082 466 4122 or grant@belugahospitality.co.za to book your hospitality tickets.